Labelled a fool by the pirate consortium, Pirate Captain (Hugh Grant) enters the world famous Pirate of the Year awards in a bid to prove to his crew and his rival captains – Black Bellamy (Jeremy Piven), Cutlass Liz (Salma Hayek) and Peg Leg Hastings (Lenny Henry) – that there’s more to him than meets the eye. After a false start, the crew cross paths with scientist Charles Darwin (David Tennant) who makes a discovery that’s sure to cement the Pirate Captain’s win. Made by the creative team responsible for Wallace & Gromit, Chicken Run and last year’s CGI holiday fare Arthur Christmas, The Pirates! In An Adventure With Scientists finds mastermind Peter Lord back in familiar territory – breathing life into a motley crew of plasticine characters. By using stop-motion techniques and keeping the CGI elements to a minimum, Lord brings a level of intimacy and attention-to-detail to The Pirates! that’s often amiss in the current crop of animation films. With a story that’s been adapted by Gideon Defoe from his own series of adventure novels, this tale of an unlikely hero’s search for friendship, self-discovery and adoration fits perfectly with the Aardman name. Fit for children and adults alike, Defoe’s screenplay is tightly paced and packed full of tomfoolery – from rapid-fire one-liners to full-on belly laughs. Sometimes it doesn’t quite hit the overwhelming heights you might expect, but there are more than enough clandestine treats on offer to keep even the most finicky viewer charmed. It’s also surprising to see Grant have such fun with his character. As most of the narrative hinges on Pirate Captain’s development from clumsy wannabe to true pirate, the pressure is on Grant to deliver. Thankfully, he does. He seems to relish the opportunity to try something new and lose himself in a character so different to what audiences would naturally expect from him. All in all, he’s the beating heart of the film, and the fore-bearer of many of the best moments. Though in his shadow for most of the time, the ensemble never fail to disappoint either. 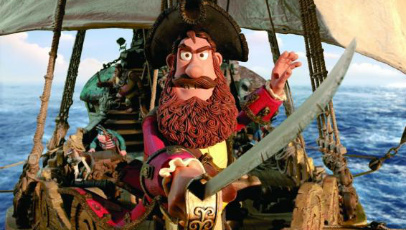 From Tennant’s devious Darwin to Ashley Jensen’s Surprisingly Curvaceous Pirate (her baboon quip is a demonstration of true comic-timing), all the key players do their utmost to ensure the dialogue hits the right notes and the film never loses steam when Pirate Captain is absent from the screen. When present, Imelda Staunton steals the show with her hilariously psychotic take on Queen Victoria. The Pirates! In An Adventure With Scientists is a delightfully unique and intimately crafted stop-motion romp packed full of hearty laughs, spot-on voice work and hidden treats for the fanatics. Unless rendered insensible, this mix of charm, wit and refinement is one that will leave you with a mighty big smile on your face. Sounds cute! I didn’t even know about this movie til now. I love Aardman films! I looked up a trailer, and this looks like a fun movie. Thanks for the review!